Agape Gifts News: Part 3 of the Most Beautiful Rosary Bracelet Ever! 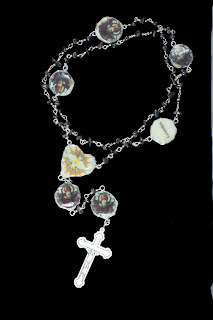 Part 3 of the Most Beautiful Rosary Bracelet Ever! The pentacle reason for all wire twisting was for the Confirmandi, Kyle, who was entering into the Catholic Church as an adult via the sacrament of Confirmation. Kyle’s rosary displayed all the information pertaining to this great sacrament: The Bishop; date; parish; location; date; sponsor; Saint’s name and image along with a dove image reminding him of the Holy Spirit’s presence. In the end everyone was excited about the gift being given and surprised about the gift received.